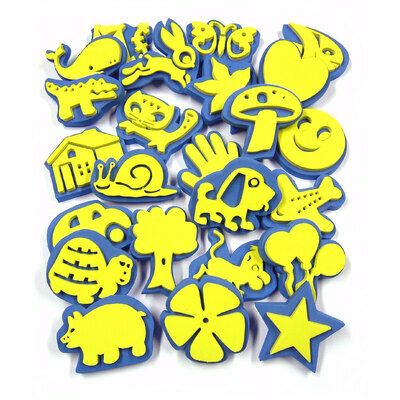 See their faces light up and their imaginations run wild as they catch sight of our Crafty Foam Paint Stamps Assorted Pack 24 during your next crafting session. Specifically sized for smaller hands, these strong foam shapes are lightweight and durable which makes them perfect for use in nurseries and primary schools. Encourage your class to press their stamp into the paint colour of their choice and go to town, decorating large sheets of paper with these intricate and engaging shapes in the most inventive design they can create. Working with a wide range of different paint and ink types, these high-quality paint stamps are a great learning tool and help to teach children about different shapes as well as educating them on different animals, vehicles and plants they encounter every day. Our Arts & Crafts category is packed with items that will encourage the very best from their creativity including our large value packs of Paper & Card and everything you'll need to create the most dazzling Displays & Mounting boards.